Made in the US with US Chickens. Comes in Colorful 4oz Tubes. Great as a Cat Treat, Too! 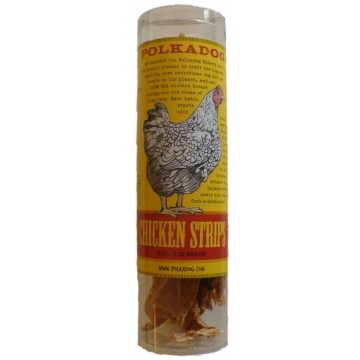 Pure strips of dehydrated chicken breast using chicken that sourced from local suppliers and raised on U.S. Farms. All chicken is stripped and dehydrated on the premises of Polka Dog Bakery's kitchen in South Boston. These strips come highly recommended by dogs in need of a little more "obedience" that will listen to absolutely anything, anything, you say if a strip is coming next. 100% Pure Natural Chicken with no added ingredients.